During the electoral period, there is a striking activity of anonymous Facebook pages that operate for the purpose of discrediting concrete candidates, politically active individuals and ongoing political or legal processes. These pages have a clearly formulated organized strategy focused on shaping public opinion using propaganda methods. They use different contents and multimedia tools to harm reputation of candidates/parties, political figures and public organizations that they target and flare up negative attitudes. Majority of such posts are sponsored and they aim to reach broad audience. In the absence of a tradition of high-level political culture in Georgia, refraining from use of misinformation and hate speech depends on political responsibility, culture and good will of individual parties and candidates. ISFED has found that smear campaign on Georgian Facebook pages has gradually gained traction over the last two years. It is likely that serious financial and human resources are devoted to it, however the State has not made any consistent steps to ensure transparency of the process while attempts to use Facebook pages for discrediting components has cast a serious shadow over the Austrian parliamentary elections and completely shaken up Austrian political circles. On October 15, 2017, election campaign ahead of the Austrian National Council elections was immersed in a Facebook scandal. The scandal broke in early October when Austrian online magazine reported that the ruling Social Democratic Party was using two anonymous Facebook pages for dissemination of conspiracy theories against their major opponent, leader of the Austrian People’s Party, Sebastian Kurz. First Facebook page titled “The Truth about Sebastian Kurz” had 16,000 subscribers and it mostly focused on neutralizing attitudes of ultra-right-wing radical voters. The page was disseminating altered photos and video clips to allege that Kurz was secretly promoting inflow of new waves of migrants from Islamic countries. Some posts suggested that Kurz was anti-Sematic. The Facebook page also reported that Kurz had secret ties with a billionaire of Hungarian origin, George Soros who supports liberal discourse. 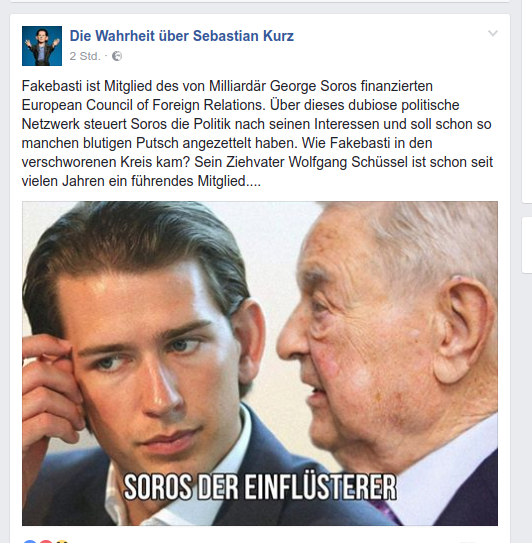 Another Facebook page “For Sebastian Kurz” posed as a site run by supporters of Kurz while in reality it published contents and information that worked against him. For instance, it published a poll on whether the government should have closed its border on the Brenner Pass in the light of NGOs allegedly planned to smuggle thousands of migrants from Italy. Profil also reported that the two fake pages had been created by an Israeli citizen Tal Silberstain, who was hired by then-PM Christian Kern as an adviser for his election campaign earlier that year. According to Austrian media, he was paid 400,000 euros for his services. Silberstain was fired by the chancellor’s team on August 14, after he was arrested by Israeli police on money laundering charges. However, Austrian media alleged that Silberstain’s team continued to be involved in the election campaign even after the party terminated his contract. The scandal about Facebook pages broke in Austrian media two weeks before the Election Day and it completely took over the political agenda. Austrian media and major political TV shows continued to discuss the above-mentioned destructive Facebook pages and their possible ties with politicians up until the Election Day. In Austria, which has a multi-party and proportional representation system, openly negative campaigning has traditionally been taboo. The Facebook scandal (known as the dirt bouquet campaign - Schmutzkuebel) made so much waves that General Secretary of the ruling party, Georg Niedermühlbichler resigned. The Social Democratic Party campaign manager Johannes Vetter called the Facebook scandal catastrophic and announced that Silberstain was responsible. He also said that Silberstain had “lost his touch with reality”. In an interview with Washington Post, political scientist Peter Filzmaier, from the Danube University Krems stated that for the first time in the history of Austria, a pivotal election moment was dominated by a negative narrative. Chancellor Kern addressed the concerns and said that he had no idea about the Facebook pages. According to him, it was an “immoral and unbelievably stupid action.” Kern’s statement was also confirmed by Silberstain with media saying that the chancellor had no idea about it. However, he did not reject the allegations about his ties with the Facebook pages. He stated that instead of negative campaign his intention was to gather data and test out different campaign messages. In the end, Austrian People’s Party won the elections and their leader, 31-year old Sebastian Kurz subsequently became the Chancellor. 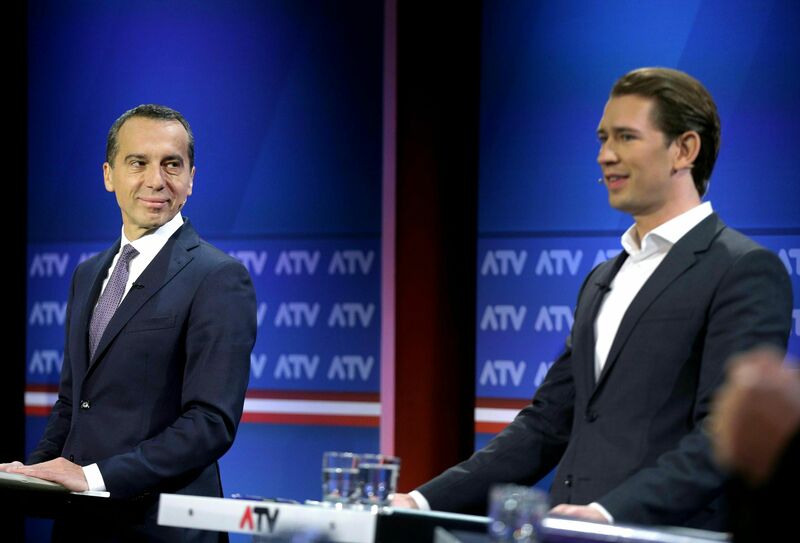 Pre-election polls indicated that Kurz was favored almost throughout the entire campaign period and therefore it is difficult to say whether the Facebook scandal influenced voters, however it certainly ran over the political life of the country like a tornado and completely set the political agenda in the days leading up to the elections. Facebook has not made any official comments about these developments. Unlike Austria, these issues are left outside any legal or public scrutiny in Georgia, where large majority of discrediting Facebook pages contain hate speech even in their titles and publish abundance of sponsored posts that are obscene and aim to discredit their targets. The smear campaign on Georgian Facebook pages coupled with the lack of political evaluations can be viewed as a gauge of political culture in the country.